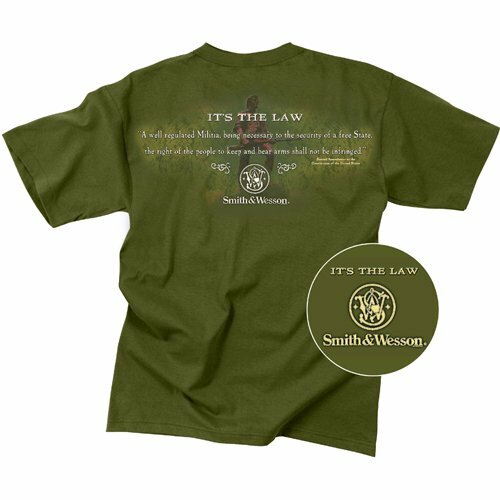 Olive Smith and Wesson 2nd amendment T-shirt is made of 100% cotton. The design of the T-shirt is officially licensed for Smith and Wesson. The design of the T-shirt is exclusive, trendy and much appreciated by people. 5.4 ounce pre shrunk cotton makes these shirts soft, smooth yet durable and long lasting. The shirt is printed on both front and back side. The left front side of the chest is printed. The back design of the shirt is so exclusive with the print which has the second amendment, of constitution of United States. This shirt looks trendy and stylish.